REPAIRS THE COMMON RUST AREA OF THE FRONT LOWER 1/4 PANEL. MADE FROM HEAVY 18 GAGE STEEL THIS PART GOES FROM THE BACK EDGE OF THE FRONT DOOR AND EXTENDS REARWARD 1/3 INTO THE FRONT PART OF THE REAR WHEEL OPENING. MADE TO FIT THE UNIQUE REQUIREMENTS OF THE CONVERTIBLE HARDTOP MODELS. 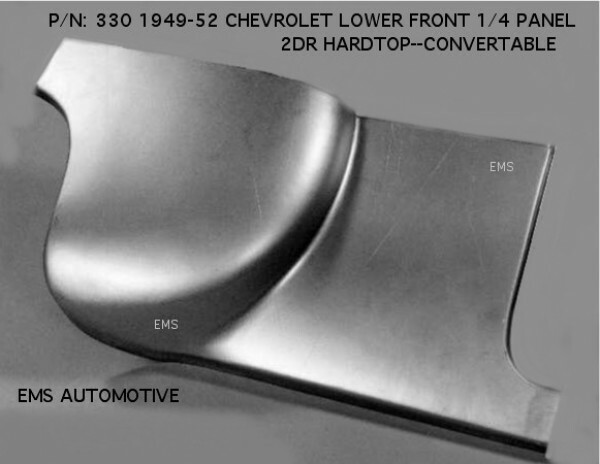 USE PART# 204 (49/50) OR P/N:232 (51/52) TO COMPLETE THE 1/4 PANEL REPAIR TO THE BACK BUMPER.